Taino people moved into the uninhabited southern Bahamas from Hispaniola and Cuba around the 11th century AD, having migrated there from South America. They came to be known as the Lucayan. An estimated 30,000 Lucayan inhabited the Bahamas at the time of Christopher Columbus' arrival in 1492. Columbus' first landfall in the New World was on an island named San Salvador (known to the Lucayan as Guanahani), which some researchers believe to be present-day San Salvador Island (also known as Watling's Island), situated in the southeastern Bahamas. An alternative theory holds that Columbus landed to the southeast on Samana Cay, according to calculations made in 1986 by National Geographicwriter and editor Joseph Judge, based on Columbus' log. Evidence in support of this remains inconclusive. On the landfall island, Columbus made first contact with the Lucayans and exchanged goods with them. The Spanish forced much of the Lucayan population to Hispaniola for use as forced labour; together with suffering from exposure to diseases to which they had no immunity, they suffered high fatalities. 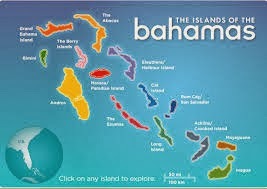 The population of the Bahamas was decimated. The smallpox that ravaged the Taino Indians after Columbus's arrival wiped out half of the population in what is now the Bahamas. Historians had long believed that Europeans generally did not begin to colonize the islands until the mid-17th century. However, recent research suggests that there may have been attempts to settle the islands by groups from Spain, France, and Britain, as well as by other Amerindians. In 1648, the Eleutherian Adventurers, led by William Sayle, migrated from Bermuda. These English Puritans established the first permanent European settlement on an island which they named Eleuthera—the name derives from the Greek word for freedom. They later settled New Providence, naming it Sayle's Island after one of their leaders. To survive, the settlers salvaged goods from wrecks. In 1670 King Charles II granted the islands to the Lords Proprietors of the Carolinas, who rented the islands from the king with rights of trading, tax, appointing governors, and administering the country. In 1684 Spanish corsair Juan de Alcon raided the capital, Charles Town (later renamedNassau). In 1703 a joint Franco-Spanish expedition briefly occupied the Bahamian capital during the War of the Spanish Succession.